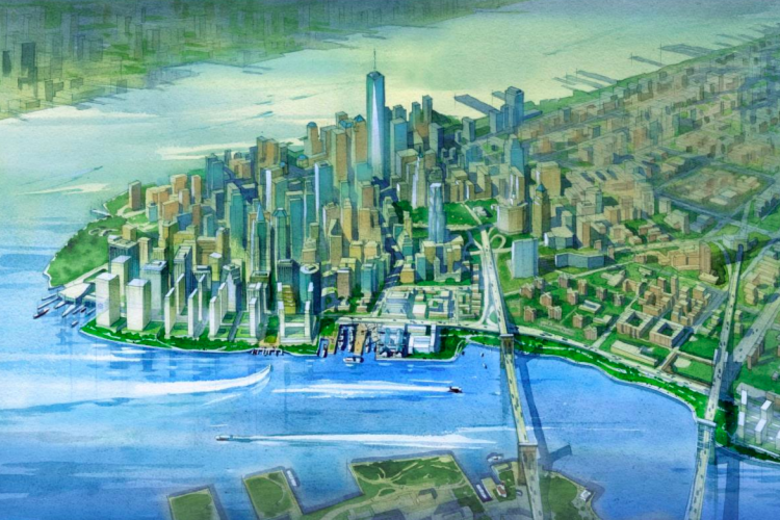 Coastal News Today | Manhattan Transfer - To save the city from rising seas, build more of it. On Thursday, New York’s mayor reiterated the city’s intent to preserve its core by reclaiming a slice of New York Harbor between the Brooklyn Bridge and the southern tip of Manhattan Island, planting as many as 20 new New York blocks into the silt to keep the rising Atlantic Ocean at arm’s length. On the one hand, the East River extension is a gargantuan, once-in-a-lifetime endeavor that would transform New York City, at a cost the mayor pegged at $10 billion. On the other, it’s just the latest step in Manhattan’s long march into the harbor, which began with blocks of muddy “water lots” sold to enterprising colonists and culminated with the 1970s construction of Battery Park City on 92 acres of landfill. It’s an example of the type of investment that cities like Miami and Boston will have to make as climate scientists’ predictions come true. It is also a reminder of how inequitable the adaptation will be, with urgency for the infrastructure of wealthy, central neighborhoods and piecemeal strategies where the land is worth less.